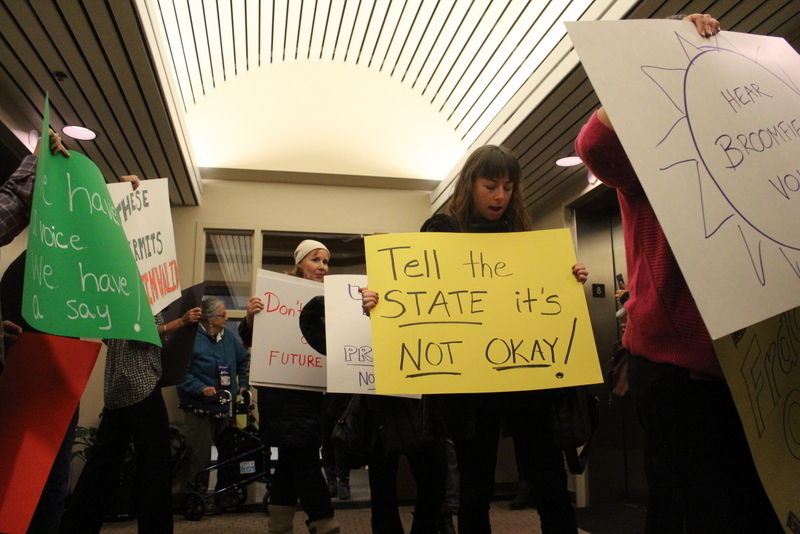 The Colorado Oil and Gas Conservation Commission (COGCC) took a verbal beating on Monday while hearing from dozens of area residents who pointed to both the commission and Colorado Governor John Hickenlooper for ignoring the health and safety risks associated with fracking. 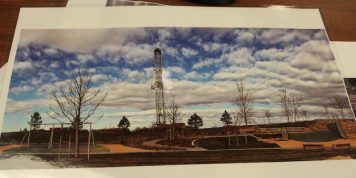 The COGCC will soon decide on approving a drilling spacing application from Extraction Oil and Gas in Broomfield. 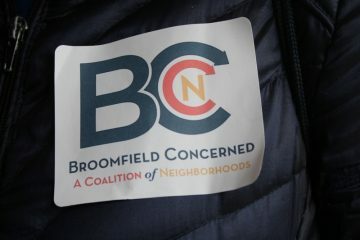 A packed hearing room and full halls held people from Adams, Boulder, Broomfield, and Weld Counties who waited for a turn to speak to the commission. 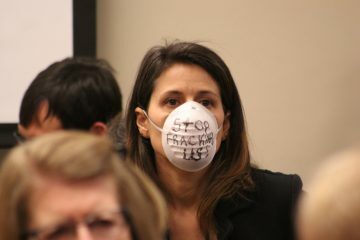 They numbered over 40 and some wore masks with messages such as “I can’t breathe,” “STOP FRACKING US,” and “Stop The Appeal,” referring to the Martinez v. COGCC lawsuit in which the Colorado Court of Appeals sided with the Colorado teens who brought the suit. The COGCC later appealed the case. 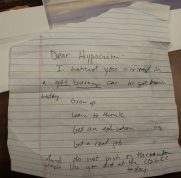 Those were the more benign messages. 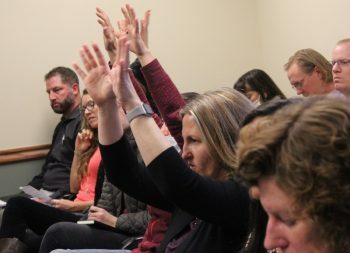 Public comment brought reports of a population experiencing different levels of hardship from the impacts of odors, fumes, water contamination, noise, and truck traffic that testimonies suggested the source as being from oil and gas operations. Five people testifying read from the COGCC’s own website of over 5000 complaints ranging from serious respiratory illnesses, to complaints of sleep deprivation from constant noise. Julie Williams said that there were over 1300 complaints so far this year. Williams, Micah Parkin, Lauren Swain, Elizabeth Gick, and Randi Webb all read complaints from all over the state beginning in 2009. Several complainants listed breathing issues, tight chests, painful coughing, and burning throats. 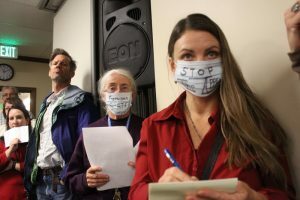 Micah Parkin (r) wears a mask that reads, “Stop the Appeal” referring to a Colorado Appeals Court decision that sided with Colorado teenagers who are holding the COGCC responsible for public health and safety. Parkin (photo left) likened the sleep deprivation to torture and asked the commission if they thought that the denial of basic human rights was acceptable. Reading from a high rate of complaints coming out of Erie in 2017, Parkin quoted from those who listed burning eyes, headaches, nose bleeds, and asthma attacks as the impacts they were suffering. Tersa Larson gave an emotional testimony about her daughter who was diagnosed with Acute Myelogenous Leukemia, and environmentally caused blood cancer. After a prognosis in 2014 of 2 weeks to live and cells that were 90% impacted with leukemia cells, their daughter is still with the Larson and Gonzalez family. 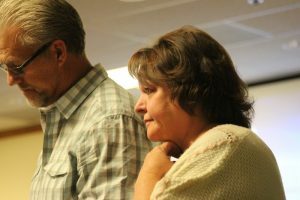 Larson recalled that in the hospital ward, that of the eight beds in the bone marrow transplant ward, that four patients had been exposed to fracking, two were oil and gas workers, one was a fire fighter in Firestone that had been exposed to fighting an oil and gas fire, and the eighth was their daughter. The Larson’s 18-month old granddaughter developed respiratory problems so severe that the infant needed respiratory treatments every four hours. The child also developed a skin disorder although both ailments cleared up after the move out of Frederick. This entry was posted in Climate Change/Environment, Human Rights. Bookmark the permalink.